This run has been on my list since I learned of its existence. However a fairly short season and the distance from any other runs has made it a long time coming for me to get on it. Ok, so a bit of it was laziness too, my parents live in Weaverville, so that is only 45 miles away or so, I guess I don’t have a real good excuse. Oh well. Anyways, this run was very pretty and reasonably fun. The highway is nearby along the entire run (in traditional Trinity River fashion) which I felt took a little away from the run. 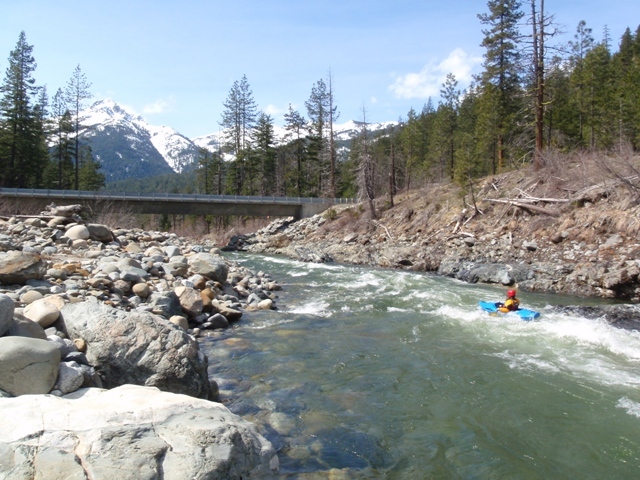 Also the numerous bridges crossing the river reminded you of your proximity to civilization. Of course for some boaters, this reminder is a good thing I guess. Regardless, I would say it was the most scenic run of similar difficulty that I have done. 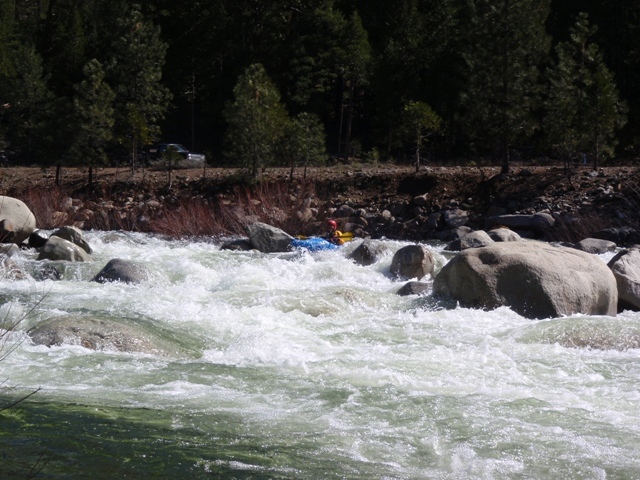 At the low (750 cfs) flows that we had, I thought the river was constant class II, crescendos of class II+ and two rapids that were standouts. 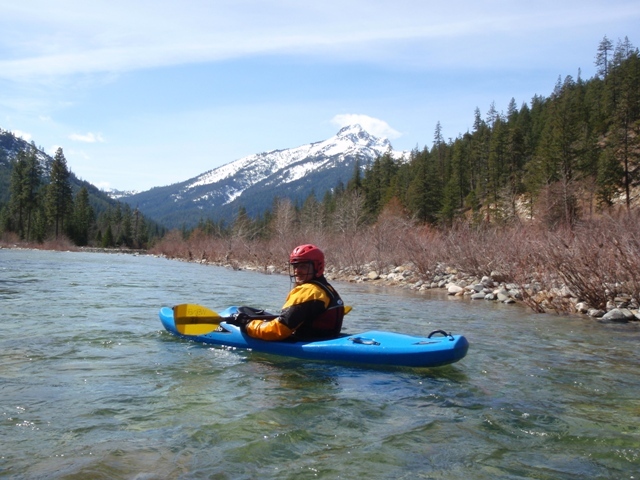 The first of these rapids is at Bear Creek and is class IV- from top to bottom and the second is at Eagle Creek and is class III+ top to bottom. 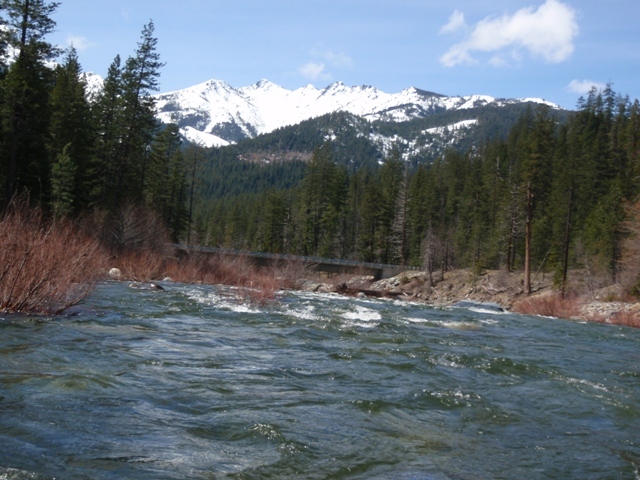 I would also imagine that these rapids would be come hole-fests at flows upwards of 2,000 cfs. However I imagine the ply would be awesome as flows increased. 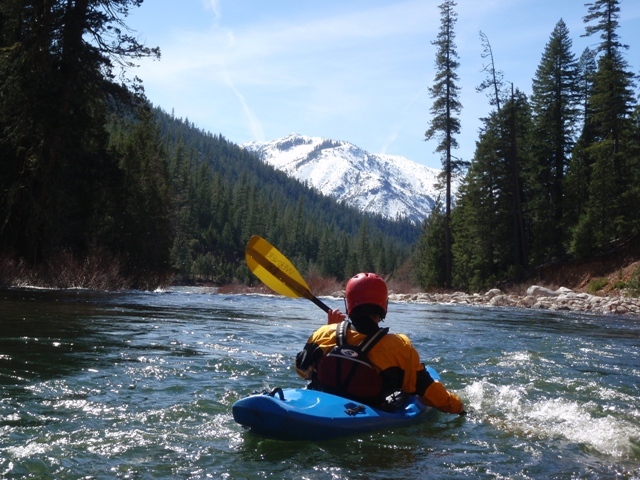 I really want to get back on this run with at least 1,500 cfs and see what type of delights it will bring. The scenery that I mentioned as pretty are he alps. My day, they were snow covered alps backed by bright blue sky. The alps truly do stand up to their name with the abruptness at which they rise from the river valley to heights in excess of 8,000 feet. Also, I want to go back and run the stretch from the end of the road to Tangle Blue Creek. Driving up a short way to the Crawford Mine you can see two nice rapids of the class IV variety and have been told by James Mitchell that there are more similar goods up there. However, flows are hard to catch. Our day the flows weren’t even high enough to put in at Tangle Blue Creek. 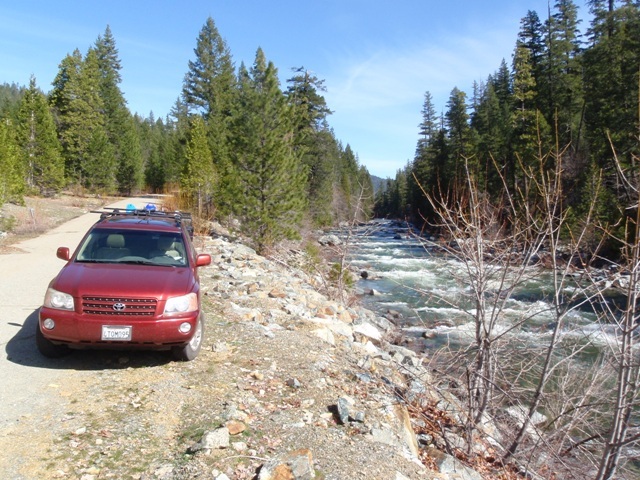 We drove down to Bear Creek and put-in just above the rapids. At this point several creeks enter and fill the river in more. You also don’t miss out on anything but wide open gravel bars. Tangle Blue Creek enters on your right. Bear Creek Upper (III-). The upper half is a rock affair, at low flows we went left cutting right. the bottom left has a sieve. With more water you could go right the whole way. 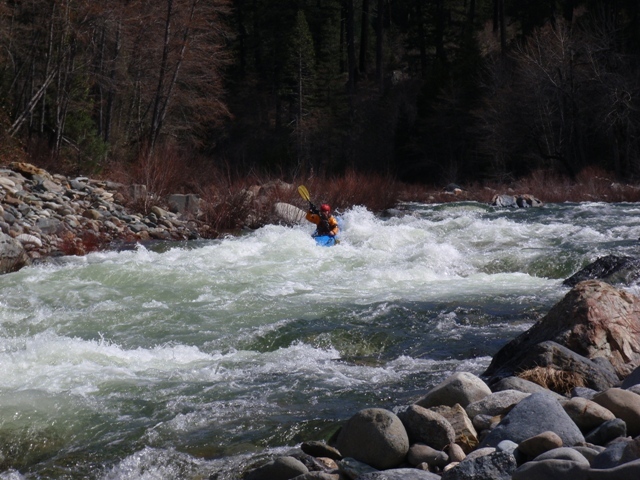 Bear Creek Lower (III+). A small pool leads to the next rapid. This is a boulder dodging affair that left me smiling. We ran down the center. Not a place to be upside down as there were many shallow rocks. Together with the upper rapid this stretch is more of a class IV-. Scout both or portage on the left. You can also scout from the road before running it. Eagle Creek Camp on the right and 100 yards later Ramshorn Creek enters on the left. The river splits just downstream around a gravel bar. The left side appears to contain more water (and does) but is badly chocked with wood. Scrape down 100 yards on the left channel. Eagle Creek Lower (III-). A short lull leads to the steep drop down the right. Several large holes need to be punched before it calms down. Right Turn (II+). Just down stream of a bridge the river makes a strong right turn. There is a log blocking the left ¾ of the river. It is not hard to get right. At high flows though I was told the river swings out harder and takes you too the rocks that become large holes. 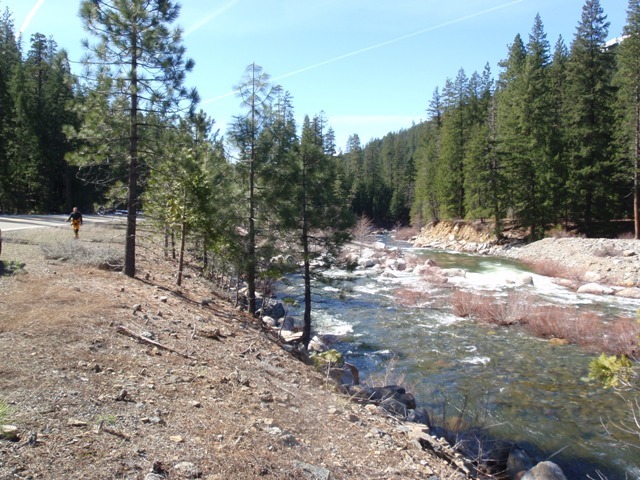 Now with the tree there this could be a danger at flows over 1,500 cfs so be aware. Take-out: On Highway 3, travel ~45 miles from Weaverville to Coffee Creek. Keep going 2 miles past the creek, you will cross two bridges. Just after the second bridge you will see Derrick Flat road on your right. Take it and park near the bridge. Put-in: Continue going up Highway 3 to where the road turns left and begins to follow Tangle Blue Creek. Immediately turn right on the small road and park near the water. 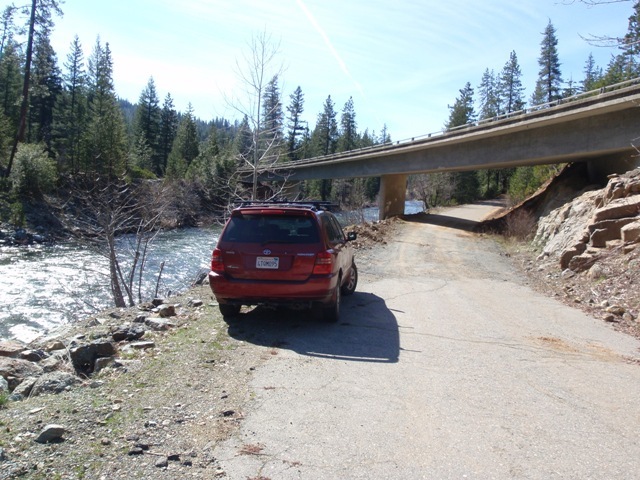 This road continues up the river if you would like to put in higher. If there is not sufficient water to put in this high, travel down river until it looks good. 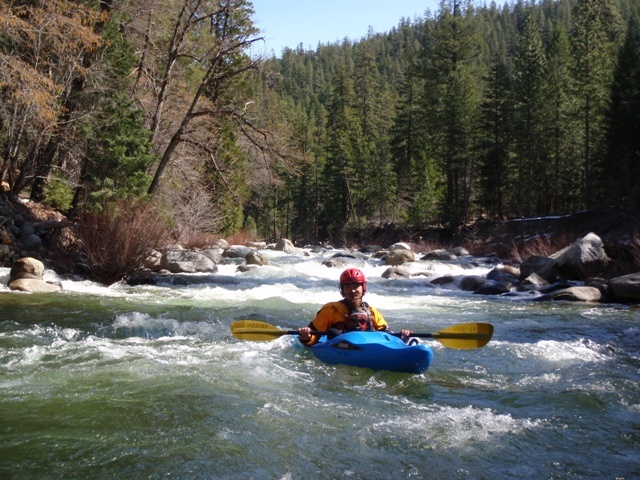 There is a turnout at the Bear Creek Rapids that allows you to put in there and not miss any of the goods.